As for us, during twenty years’ reign, we have known much bitterness. Henceforth, we shall be happy to be a free citizen in an independent country. I would prefer to be a citizen of an independent country rather than Emperor of an enslaved one. I do not wish a foreign army to spill the blood of my people. If your government had given me a thousandth of the sum it spent to depose me, I could have won that war. In this decisive hour of our national history, union means life and division means death. The time has come to put an end to the fratricidal war and to recover at last peace and accord. Bảo Đại, born Nguyễn Phúc Vĩnh Thụy, was the 13th and last emperor of the Nguyễn dynasty, which is the last dynasty of Vietnam. From 1926 to 1945, he was king of Annam under French ‘protection’. During this period, Annam was a protectorate within French Indochina, covering the central two-thirds of the present-day Vietnam. Bảo Đại ascended the throne in 1932. The Japanese ousted the French in March 1945 and then ruled through Bảo Đại. At this time, he renamed his country “Vietnam”. He abdicated in August 1945 when Japan surrendered. He was the chief of state of the State of Vietnam from 1949 until 1955. Bảo Đại was criticized for being too closely associated with France and spending much of his time outside of Vietnam. 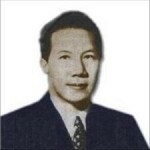 Prime Minister Ngô Đình Diệm ousted him in a fraudulent referendum vote in 1955. Bảo Đại died in a military hospital in Paris, France, in 1997. He was interred in the Cimetière de Passy. After his death, his eldest son, Crown Prince Bảo Long, inherited the position of head of the Nguyễn Dynasty.